Duolingo is okay, but I feel like it relies too heavily on written language and doesn't focus on conversationally useful constructions and practice. I used it for German a little bit and tested more advanced stuff on Spanish and found it sort of underwhelming. As far as resources for Mandarin, personally, I took a class and found it pretty easy to pick up, but I'm the kind of person who flourishes in structured classes, so that approach isn't for everyone. There's a lot to be said for not everyone learning the same way. What works best for one person may not work for another. I think this is especially true for foreign language acquisition. Only half an hour in, I can already tell that Duolingo is not for me. It may be for you, though, which is why I want to emphasize that I'm not trying to scare people off of it. I just want to share my own impressions of the application. I registered an account with Duolingo, connected to an old e-mail account and registered with the Talon87 username. I told the app that I wanted to learn French. It asked me if I was a beginner or if I had had some experience with the language. I told it that I had and was shuttled away to a placement test. "Good," I thought. "Let's see how high up it places me. " When I sat a placement exam at Purdue University for French in 2004, I had not studied the language for some three years. I managed to test out of French 101, 102, 201, and 202. I was pretty proud of myself for that. (Still am! ) I didn't expect to place that high this time around. I haven't touched French, minus the occasional humoring a native speaker like Okiku here or there, for almost ten years. Indeed, it's been thirteen years since I last took any coursework in French. But I still remember enough of the basics that I figured I would be placed somewhere around the 201 level. Now, do I think I could use a 101 refresher? Oh, absolutely! In fact, in a sense I was a bit relieved to have been placed here as it meant (or I had hoped it would mean) that I would be able to get a solid refresher on the fundamentals I feel so rusty on. But at the same time, do I think that the exam was competent in its placing me here? No, I do not. The exam never challenged my understanding of French grammar. Out the gate, a few early slip-ups on words I'd never heard before seemed to land me squarely in the land of learning your colors and foods. And I aced every single one of these questions too. Understandably: they all had easy grammar and easy vocabulary. To me, this is a pretty big flaw of the application. If they're going to bother with a placement test, then they should care a bit less about lexical command (which is highly variable) and a whole lot more about command of grammar (which is much less variable and also much more important). They should also design the test to allow people to climb back out of Hell once they've toppled in. What if someone who speaks French at a proficiency level of, say, 301 or 302 had been given the same two words I was given? And what if he had failed to get them too? (Which I could totally see happening, by the way. One was an obscure word for boot -- no, it was not botte -- and the other was an obscure word period which I've already forgotten.) Like me, who aced every question that followed, he'd never have been given an opportunity to prove that he belongs in a 401-level course. He'd have been plopped down amongst the other preschoolers, made to learn his ABCs and 123s before he could skip ahead. 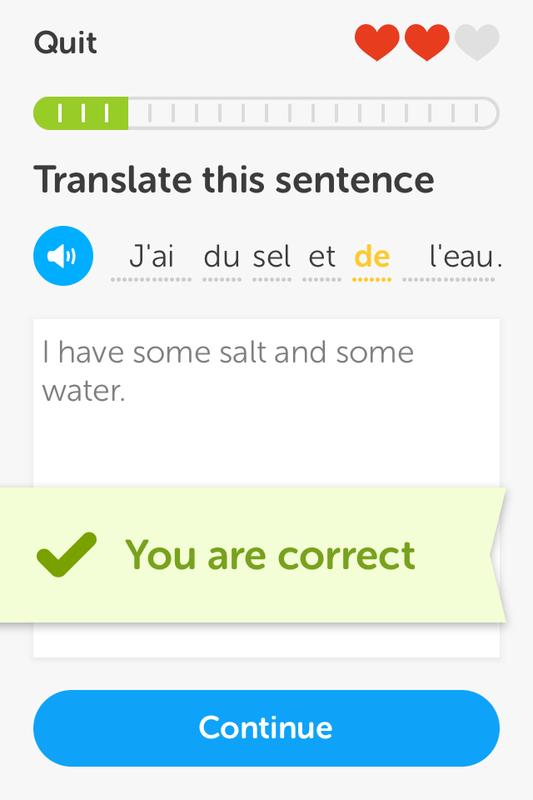 Duolingo's approach to teaching French is unconventional. Shirking the textbook-style approach to learning a foreign language, Duolingo instead gives students small modules which teach ten to twenty vocabulary words at a time. It does not expressly teach grammar; rather, it exposes students to authentic French grammar and asks them to pick it up by trial and error. And expects them to swim. The fact that I got this question right on the first try tells you something. It tells you that I can already decipher the French words for "he has," "duck," and "turtle." But had you asked me to recall what the word for turtle was without showing me tortue, I'd not have been able to. The same goes for duck. This isn't really teaching me French -- rather, it's flashcards quizzing me on whether I know French already or not. Providing an English sentence and asking the student to provide the French translation. The same as the above, but this time placing all of the correct words in a word bank (along with some incorrect words) and asking the student to drag and drop. Asking the student to listen to an audio sample and type out the words. But nowhere does it offer a grammar lesson. Nowhere does it provide an organized list of vocab words, with French on one side and English on the other, for the student to study that way. The only way to pick up that "canard" means "duck" is, if you don't know it already, to get it wrong the first time you're asked and to then get it right the next time you're asked about it. Want to learn other animal names right now? Too bad! 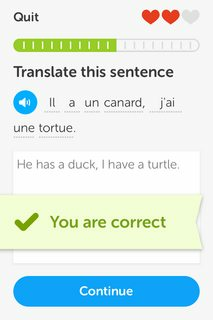 The app decided to just teach you duck and turtle this time. Want to ask how "tu as" is pronounced? Too bad! You'll have to wait for an audio question which offers "tu as" to randomly come up. Another example that came up was in the lesson where they were trying to teach me the adjective seul "alone". Tabling discussion of ambiguity between some adjectives and adverbs (and how different languages might classify seul in different ways), what I want to focus on here is the verb, lire, "to read." Note that they don't offer the infinitive form anywhere. Note that this is the first time I've even seen the word come up. Just ... SUDDENLY THERE, there is lisent. This was a drag-and-drop exercise; by process of elimination, most beginners could process that "lisent" must be "(they) read" since it's the one word there that they don't know yet. 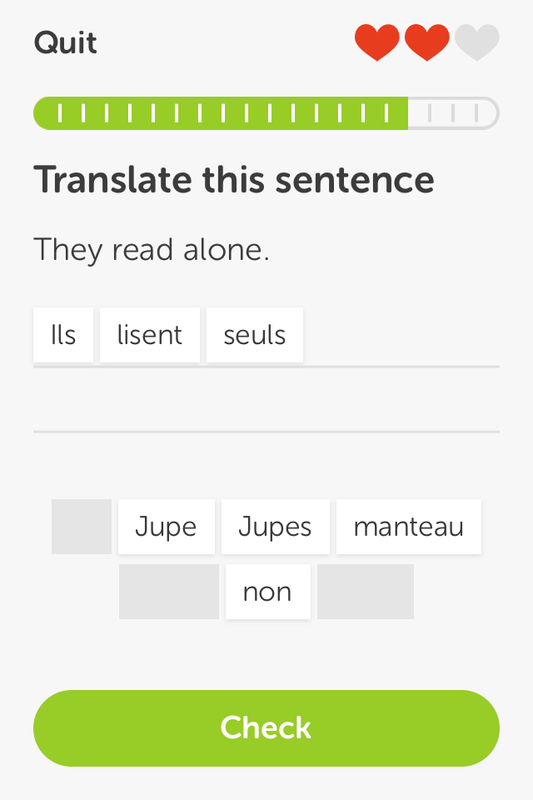 But Duolingo is only providing them the conjugated verb. It's not teaching them about -re verbs. Nor is it teaching them that lire is an irregular verb and thus does not follow standard -re conventions. Nor does it at least provide them with a list of lire readings for all six main pronoun cases. It just deposits "ils lisent" in this exercise and then moves on, happy with itself. Personally, I dislike this system. It's not how I learn a language best. I learn best with a more structured, conventional approach. Show me a bunch of vocab words at once that all have to do with one another (e.g. words that have to do with a farm) and then let me practice using them in sentences. Show me all of the grammar cases for a new verb -- at least the ones you've deemed I'm ready for at this time -- and then let me practice them. I don't want to learn, in some fucked-up order, j'ai followed by nous avons followed by ils ont followed by tu as, etc. I want it tabulated in a logical order. "Single 1st, Single 2nd, Single 3rd ... Plural 1st, Plural 2nd, Plural 3rd." It makes sense to me that way. And that's how it would be taught in most French textbooks. (FOR GOOD REASON! , says I. ) But not so in Duolingo. If this were the first day of French class, then maybe? I can accept that when you first start off with a language, there has to be some rote acceptance of certain verbs and phrases because you know nothing of the language yet. But supposedly I skipped the first ten lessons or some such and wound up here, somewhere slightly past the halfway point for French 101 competency. I'm pretty sure that it was in French 101 that I began to learn my basic verb constructions for -er verbs. Possibly by the end of that semester we were learning our -ir verbs and our -re verbs as well. We're past the point where it's acceptable for you to just give me a conjugated verb and not offer me the infinitive nor the rules for its conjugation. 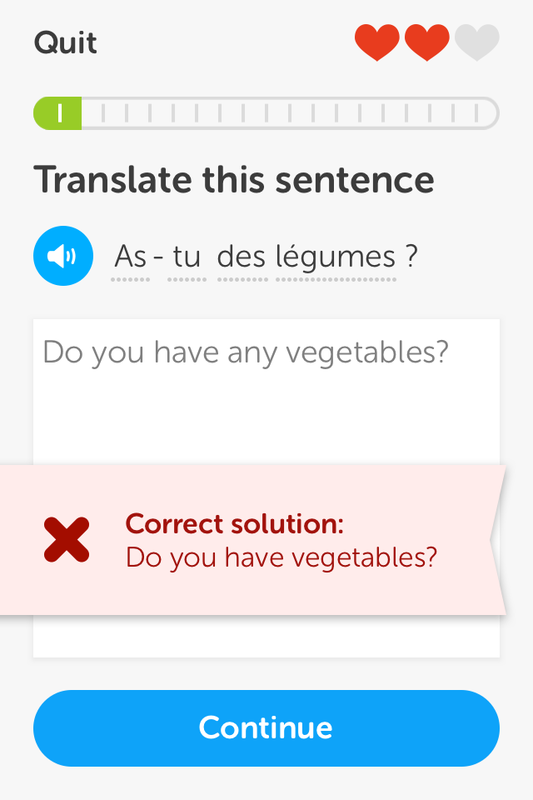 On the left, Duolingo asked me to translate the sentence "As-tu des légumes?" I translated it as "Do you have any vegetables?" Duolingo thought about it for a second, then decided I had gotten the answer wrong. "Sorry, but we were looking for 'Do you have vegetables?'" Not only are the two answers for all practical intents and purposes equal, but getting down to the technical nitty gritty, my answer is better given the use of des and the etymological psychology behind its usage. (The idea in French is that you don't have all of the vegetables in the world -- you have some of them. So you ask someone if they have "of the vegetables," i.e. of the entire stash in the world do they have some portion, rather than asking them if they have "the vegetables" which would imply some group of vegetables in its entirety, the group unspecified defaulting to the world itself.) What annoys me more is that, even if someone at Duolingo wants to get nasty with me and say, "No, you're wrong , it's 'vegetables' and not 'any vegetables', 'any' would be _____________," depending on the context my translation is 100% accurate. Example: you're at a friend's house, you're in their kitchen, you're going through their closet looking for ingredients to use for cooking dinner, and you want to ask them, "Do you have any vegetables?" YOU WOULD ASK THE SENTENCE DUOLINGO PROVIDED. Long story short, I don't feel like this should have been marked wrong. 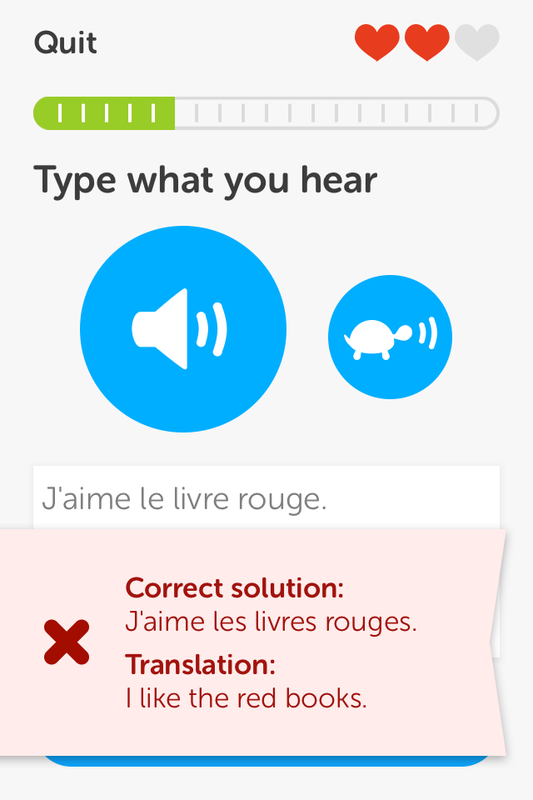 This is Duolingo's biggest problem in my book: the A.I. is too inconsistent in its grading of answers. And that is dangerous for beginners who are desperately trying to get a foothold with the language. They can only learn by trial and error with this app. You don't provide formal grammar lessons. You don't provide a human being to offer on-site assistance. They can only type in answers, Family Feud video game-style, and hope that what they type in is counted correct. So when they type in "Do you have water?" one time and you count it right ... and then when they type in "Do you have some water?" a second time for the same sentence and you count that right ... it can be confusing for the student. Here's another example that's absolute horseshit. 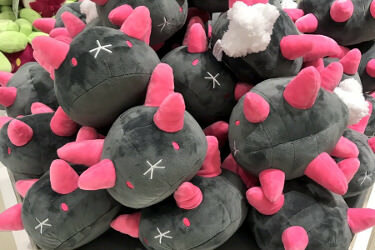 The app asks me to translate into French the phrase, "pink elephants." 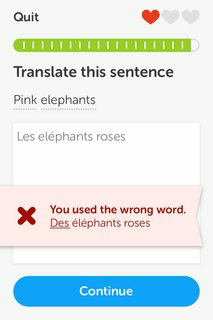 I could have probably just said éléphants roses, but instead I wrote "les eléphants roses," thinking of the phrase in my own brain as "the pink elephants" and not as "some pink elephants." It wasn't specified in English, so either should be fine anyway, right? Besides, when in doubt, les would be the default. Duolingo disagrees. 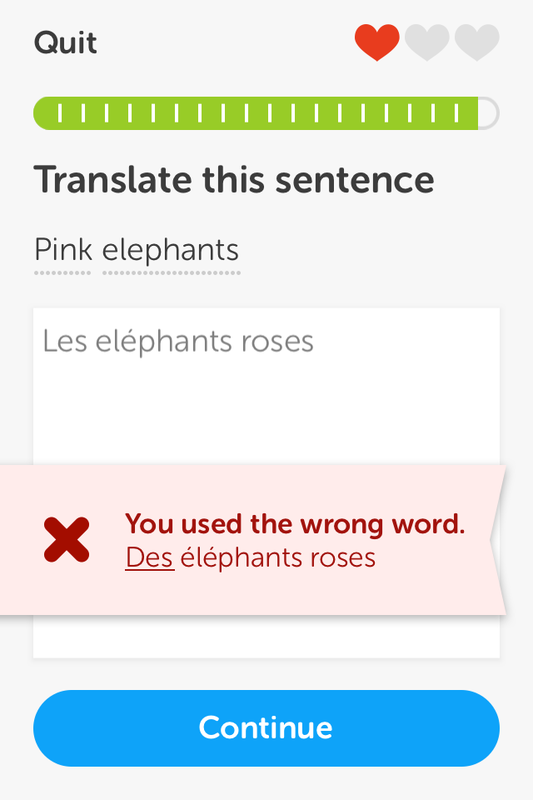 It counts my answer wrong and screams at me, "DES éléphants roses, dipshit! Not LES!" Not only is this horribly misleading to students ... but it's unintentionally hilarious that the app is more hung-up on my decision to go for les instead of des (EITHER SHOULD BE FINE HERE) instead of grilling for me dropping the accent aigu from the first e in éléphants. These are only my first impressions with the app. I will continue to use it one or two more times minimum before I put it away forever. But from my first trial with the app, I have to say that I personally dislike it. It doesn't really "teach" language so much as it just throws flashcards at the student and says "FIGURE IT OUT, JACKASS! " As an app to make foreign language students feel good about themselves, I think it's fine. Give the app to a French student in 301 or 302 and say, "See how far you place! " and he'll find it amusing, to be sure. 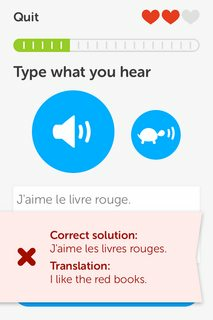 But as an app intended to actually teach French to someone who has never studied the language before, I don't find it to be good. It's too disorganized, too unclear, and the A.I. has weird hang-ups. As a learning tool, I still don't care for it. As a refreshment tool, I'm starting to enjoy it. Just completed a bunch more lessons. While I don't intend to commit to (re-)learning French right now, it is fun to see how much I can ace based either on 1) cognate recognition, 2) context clues, 3) remembering stuff from 2001, and 4) deductive reasoning. This is no way to learn/speak a language, but as a means to refresh decoding a language, it's decent little practice. Anyway. 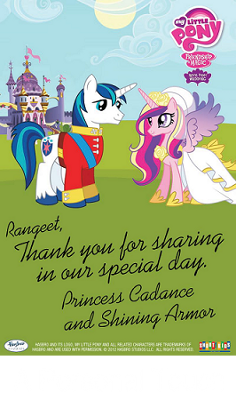 App's kind of cute as an ego booster. But as an actual long-term approach to learning French, for me at least it's one big "No way! XD" Your mileage may vary. Would people recommend structured evening classes? My self discipline is... poor... so I think it fairly likely that I won't commit to learning a new language, particularly a very challenging one, if I'm doing it all myself. Day 3 with Duolingo. At this point I'm just aiming to complete all of the modules for transient bragging rights. While it's fun to temporarily remember that hier means "yesterday" and essayer means "to try," I lack the motivation -- or, it almost feels like, the maturity? -- to take re-learning French seriously. I never intended to do this at this stage in my life and I still don't: I'm only too content to coast through the modules on a combination of a) 1990s Talon's efforts, b) guesswork, and c) the simplicity of most modules. Things are learned in the shortest of short-term memory and then forgotten. What does sinon mean again? Explain when to use eux? I can't. And I don't presently care to. That's a huge problem, albeit a personal one, but I feel like it reflects poorly on the app as well. No college professor would pass a student who demonstrated a capacity to know words for five minutes but not five weeks. There are quizzes, tests, and final exams all meant to not only benchmark your progress but to also redetermine your capacity to understand and to form sentences with the language. Duolingo has no such exams: the eager student is expected to willingly re-apply himself to the individual (and frankly tedious) modules if he wants to confirm for himself that he remembers what he's studied. These are all things that I remember from over ten years ago -- and that's the only reason I haven't run away screaming from this app yet. An explanation about essayer and payer would be nice, guys! You don't need to throw us into the deep end and shout "SWIM! " with your essaies and your faisons. The app feels like it has its priorities in the wrong spot. There is far too much emphasis on vocabulary and intermediate minor grammar, too little on beginner and intermediate major grammar. I really don't need to know words like sauf "except" or combatter "to fight" before learning basics like the passé composé or future tenses. Better that I can say "I ate" or "I will eat" than that I can say "I pay my taxes" or "I fire the delinquent." Nowhere is the lack of grammar lessons more apparent than in the example of il a plu depuis hier. To the app's credit, depuis is one of the grammar lessons it has actually bothered to teach. "It means 'since,' but in French they use it with the present tense. Example: 'I have been writing since morning' becomes 'j'écrit depuis le matin'." Okay. Cool. So then the app asks me to translate, "Il pleut depuis hier." And so I do: "It has been raining since yesterday." "Correct," the app tells me. Four slides later: "Which of the following means 'it has been raining since yesterday'?" And all three choices ... use the past tense. O_o All three of them lead off with "il a plu" instead of "il pleut." The one which seems closest to correct is "il a plu depuis hier," so I pick it, aaaaaaand ...? "Correct! " No explanation given as to why we're suddenly using the past tense now with depuis. No explanation as to how both "il pleut depuis hier" and "il a plu depuis hier" translate to the same English sentence of "It has been raining since yesterday." I think there is a lot to be said for professional instruction. But there are too many variables for me to promise you that this is a good or a bad idea. I think it will come down to your time, motivation, money, and satisfaction. This is what I'm doing this fall for German since my school doesn't offer any more classes beyond what I've taken. I'm optimistic about it. I've signed up for a year of beginner Mandarin, once a week and some structured practice. Was able to get an alumni discount from my grad school so it's not quite as painful as it might have been. At the end of the day if I'm terrible I can stop going and even in that case I might remember one or two phrases. But hopefully I can eventually speak the language well and use it out there. I know German now. Have to keep my skills fresh for the sight examination later this year, so I'm planning to read Harry Potter and the Sorcerer's Stone in German this semester. 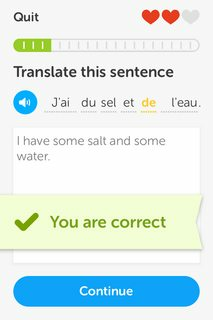 Will read your thoughts on Duolingo later, when I'm not traveling as much - I was unimpressed when I tried it out with French last year, but maybe it's more useful for vocab than grammar, which is the only really hard part about languages. Today is Day 7 of using the Duolingo app. The past three days (and today, so far, makes the fourth) have seen me using the app pretty close to the bare minimum. I got my required 20 XP (equivalent to taking two lessons once each) two of the days, 40 XP yesterday, and so far 20 or 30 XP today. As far as the app's concerned, that's great. But it's a marked dropoff from the hundreds of experience points I'd been gaining the first few days (and not counting the free 600 to 700 from the entrance exam either). My score right now is somewhere in the 1300s? But only about 100 of those points come from Wednesday onward. I feel like I'm remembering some French grammar here or there through exposure, but for the most part I remain frustrated by the app's priorities. Vocabulary is important too, yes, of course, but at this early stage of the game it's frustrating to be bombarded with hundreds of different words and so little grammar. Many of the words are similar, too. For example, métier vs. emploi, which I gather from the app is the difference between the words "profession" and "job" in English. I mean, don't get me wrong: even in my Japanese 101 class we learned words like "job" and "part-time job" before the midterm exam rolled around. But I'm only giving you word examples. The point I'm trying to convey, and one which I guess you'll just have to take my word for barring picking up the app yourself, is that Duolingo showers the user with word after word after word after word after word while withholding verb conjugations. 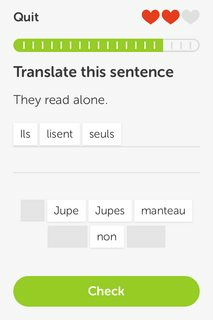 Insofar as it does teach grammar, Duolingo teaches all the other components of the sentence besides the verb. For instance, right now I'm in the midst of some rudimentary adverb and preposition lessons. For example, très "very", trop "too", après "after", and so on. These three I remember from years ago, being as they're very common words, but there are other, less common adverbs and prepositions the app has taught me which I confess I can't recall right this second. To the app's credit, it has at least taught the student how to form infinitive phrases using the present tense. Ages ago it introduced the idea of coupling "to go" with an infinitive to generate the English "I am going to ______", but more recently it's begun to familiarize the student with other infinitive phrases, such as "I like to _____", "I must ______," and so on. As such, I don't think the passé composé lessons can be too far off. We'll see. As a learning aide, I still find the app to be not for me. As a refresher, I find it to be suboptimal but amusing. Purely for that amusement I'm sticking with it; but as reflected by my decline in daily usage of the app, that amusement may not endure much longer. I think that more serious students will find the app more beneficial than I have, although I maintain that even were I taking it seriously this app would not be for me as a newcomer. It is just not how I learn a language. :\ Modules are too short, explanations are too few and far between, grammar takes a backseat to vocabulary, so on and so forth. I'd recommend Anki to you all. It's like an intelligent flash card program. If you press that it was easy to remember, it doesn't show you again for a while, if it was difficult or you forgot, then it'll show you again quickly. There's cards for most languages. I've been using it for a year-ish now. With it I was able to memorise 1500+ kanji I wouldn't have otherwise, very happy with it. I've been sharing my sister's Mindsnacks app and it's been a blast. Perfect for learning vocab if that's what you're looking for, and it does so by deceptively masking it as games. As someone who learns grammar very easily but is dreadful with vocab, it's perfect for me, but it might not be what you're looking for if you're the opposite. Can't hurt, though. And it's got a humongous array of languages. Obviously the flipside is that it isn't free, but each language is, what, three dollars? I can't remember, but it's not a lot. Not really a language, but I want to learn IPA(International Phonetic Alphabet) because I've always been extremely awful with pronunciation. Anyone here who's learned it specifically? Any idea what kind of investment it generally is, good resources, etc? Thanks. "If you don't use it, you lose it." Learned it in college. Haven't used it regularly in years. Have to look a lot of things up now. Embarrassing but what can you do. If you think you'll be using it semi-frequently at the very least, I'd say it's a worthwhile investment. You'll be able to impress most language departments with it, as most of your university professors who specialize in linguistics are going to be familiar with it. Like any language or writing system, IPA's utility is limited by the number of people who can read it. IPA tends to be used amongst fellow scholars because of its precision, a powerful property of the writing system that allows any two people who are both IPA-knowledgeable to communicate precisely which sound they mean to convey without having to resort to the sorts of tricks you see me using in the Japanese thread. But why do I use such tricks at all then? Precisely because IPA is worthless when I'm trying to teach people readings and they don't know IPA. Which is easier, which is more likely to succeed? Me barking at people that they need to go learn IPA before they come back and ask how to pronounce 工場? Or me just telling them, "It's koujou, pronouned KOH-joh with both vowels being held for two beats (moras)"? Obviously the latter, as awkward and cumbersome as it is, is the better approach with people who don't know any IPA. When you try to write in IPA to people in a community where it's largely not used, you just come across as a showoff. Also, and more importantly, you fail in your mission to communicate efficiently. ^^; The entire point of IPA is to communicate sounds precisely and efficiently. If you're going to fail in that mission through your use of IPA, then you shouldn't even use IPA at all. tl;dr it's something that linguistics scholars use when communicating ideas amongst themselves but which will not be very useful to you in trying to talk to anyone else. P.S. One of the disappointments of IPA is that it can't correct for errors in perception. That is to say, many times I have seen words written in IPA on Wikipedia where I know, as a native speaker, that that is not how the word is pronounced. Made-up example based on real experiences: they'll say that we pronounce the first vowel in the word "color" as halfway between an ah and an oh when no one does that and it is totally an uh sound. The point of this example being, these are not dialectal differences. England, Australia, the United States, Canada: no one says the word the way that I'll see many IPA spellings mistakenly indicating the word is pronounced. Well, mostly I'd want to learn it so I can understand the pronunciations given in dictionaries as well as Wikipedia. However, if it really is not very correct in some cases, then it wouldn't be too useful for me as I'm looking to only read it, not write it. From what I know, knowledge of IPA also helps you to write pronunciations phonetically anyway(without using IPA, that is to say), so you don't necessarily have to use IPA- but knowing it will let you figure out easily how you should type a pronunciation. For those wanting to see a more complete list (along with IPA readings! ), here is Wikipedia's article on -ough. What IPA would help you with, in the case of these words, is learning how to pronounce them correctly. You'd look up the words in an English dictionary, see the IPA spellings, and be like, "Ah. So that's how it's pronounced." But again: if your source is wrong, then that's worthless. Your source has to be correct for IPA to not lead you horribly astray. Well, obviously, I'm not at that basic a level, and it's not really about spelling. I'd just like to look up, say, entrepreneur, and check from the IPA if I'm pronouncing it correctly instead of having to find a recording - and checking pronunciations like that is something I do quite a lot. What I was getting at with my second paragraph was that knowing the IPA could help you frame a word's pronunciation in "basic" language. Just as an example, I could probably figure out a better way to explain how to pronounce "Rangeet" than "Say "row", like the boat, not as in argument, then follow it with an "ng" sound. Then say "geek", but with a t. Rohng-geet." Though how in the blue blazes did roan become "ran"? Who would ever see "ran" and think to pronounce the vowel as the same in the word "blow"? I guess this just proves that, no matter the place or the people, English spellings are phonetically fucked. Yeah, there are many different spellings and pronunciations of Rangeet, but the difference between "Ran" and "Roan" is Hindi vs Bengali. But it's romanized to the same English. J vs G is...honestly, I have no idea where the J comes from because the name of the river is Rangeet, not Ranjeet. But yeah. Rangit vs Rangeet is basically the same, but in Hindi it'd be like "Ranjit" in HIMYM(but with a hard g) and Bengali it's Rangeet like what I described. This is why people just call me 'Geet. As a Linguistics major I had to learn IPA for a number of classes. It's pretty straightforward and easy to learn if you have some sort of audio guide. Thanks! I'll start searching if I can find some cool ones just to get started. Just curious if anyone else is learning Polish. I've amassed quite a few resources and would be willing to share my findings. Last edited by Shuckle; 09-17-2014 at 01:01 PM. Polish isn't a very popular language (for a variety of reasons, one being Europe's constant desire to see Poland not exist), but I'd be interested to see what you've found. When I go into the inner depths of Southampton I feel like I should probably learn Polish because I suddenly don't understand any of the shop fronts. Polish is a decent enough second language to know if you're travelling Central Europe but German is probably a better bet on that score.